Ayala Malls Cinemas, in partnership with ABS-CBN Film Restorations group, goes back in time reflecting the best of Philippine cinema with the upcoming“Cinema Classics – Filipino Films in Retrospect” at U.P. Town Center from January 11 – 15. The first installment for this year, reviving the classics at U.P. 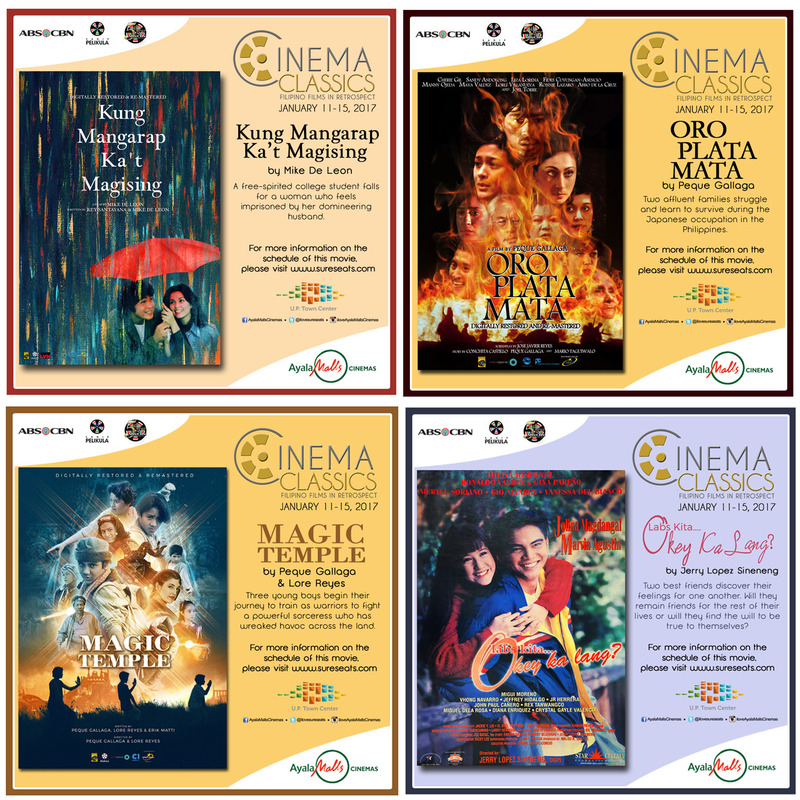 Town Center, the restored Filipino classic films will also soon takeoff in other Ayala Malls Cinemas. 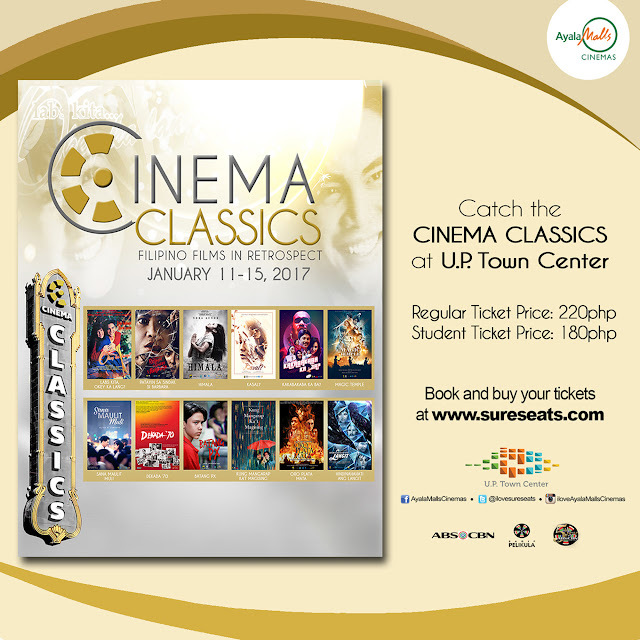 “We are proud that Cinema Classics opens at U.P. Town Center which features the works of Filipino master filmmakers in different genres”, said Rowena M. Tomeldan, President of Ayala Malls. You can expect to watch films such as Ishmael Bernal’s Himala (Nora Aunor); Mike De Leon’s Hindi Nahahati ang Langit(Lorna Tolentino, Dina Bonnevie, Edu Manzano and Christopher De Leon), Kung Mangarap Ka’t Magising (Christopher De Leon and Hilda Koronel) and Kakabakaba Ka Ba (Charo Santos, Jay Ilagan, Christopher De Leon); Laurice Guillen’s Kasal? 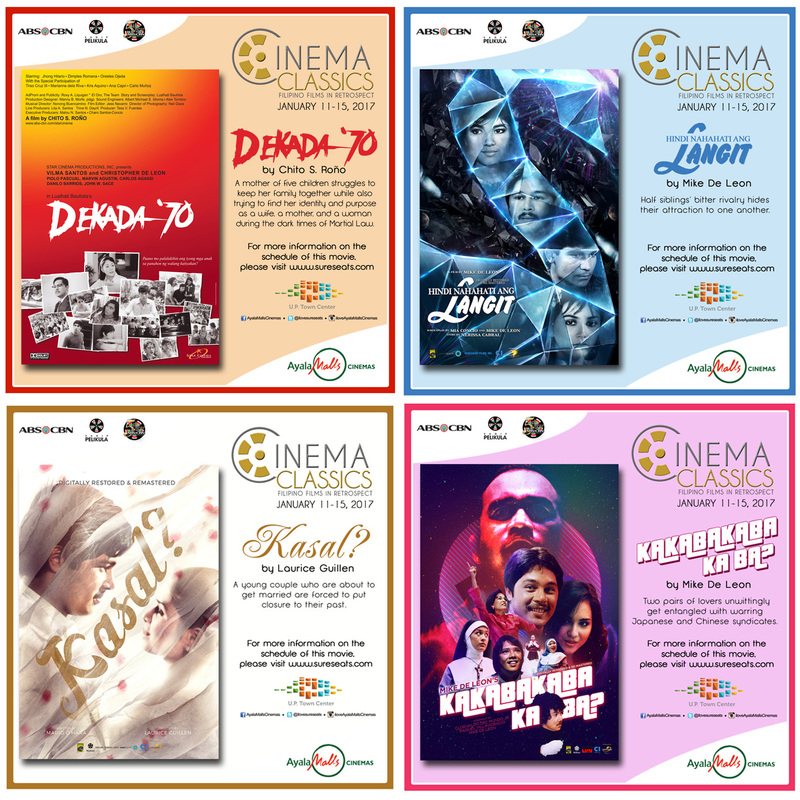 (Christopher De Leon and Hilda Koronel); Chito S. Roño’s Dekada ‘70 (Vilma Santos, Christopher De Leon), Patayin sa Sindak si Barbara (Lorna Tolentino, Dawn Zulueta); Olivia M. Lamasan’s Sana Maulit Muli (Lea Salonga, Aga Muhlach); Jose Javier Reyes’ Batang PX (Patrick Garcia, Zsa Zsa Padilla); Peque Gallaga’s and Lore Reyes’ Magic Temple and Peque Gallaga’s Oro Plata Mata. In recent interviews, ABS-CBN’s Leo Katigbak is grateful for Ayala Malls Cinemas’ support, “We are lucky that our Sagip Pelikula Film Preservation Advocacy has strong support from the Ayala management and it is very critical for us that our partners are just as passionate and committed to making this effort viable and sustainable. 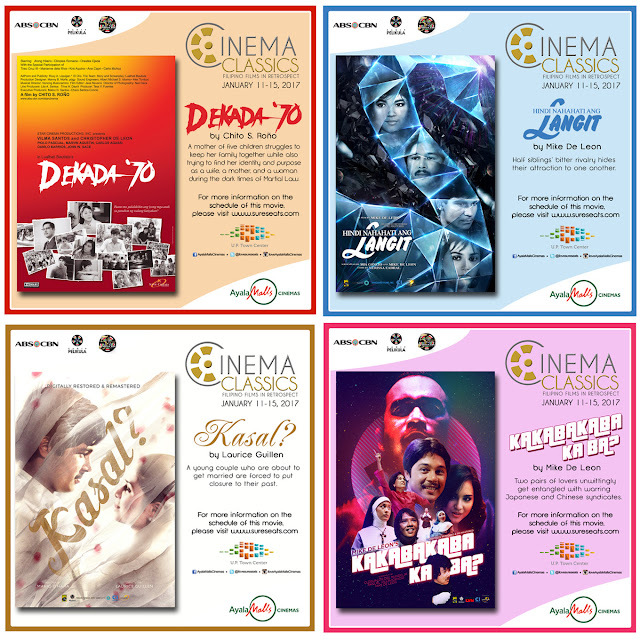 We have restored more than 120 titles already but unless people get to see them, we can’t really say we have succeeded in preserving our legacy. We are hopeful that the partnership with UPTC is the start of more tie-ups with Ayala Malls,” said Leo Katigbak, head of ABS-CBN Film Restoration Project. Setting out at the Ayala Malls, this program will be featured in various Ayala Malls Cinemas this year. U.P. 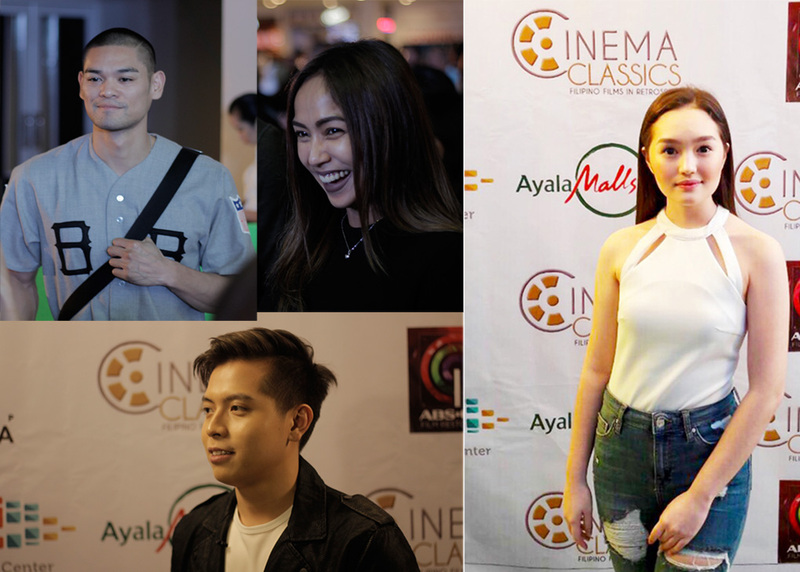 Town Center begins to showcase the best from the past in Philippine cinema this week until January 15. Tickets cost P220, with a discounted rate of P180 for students. 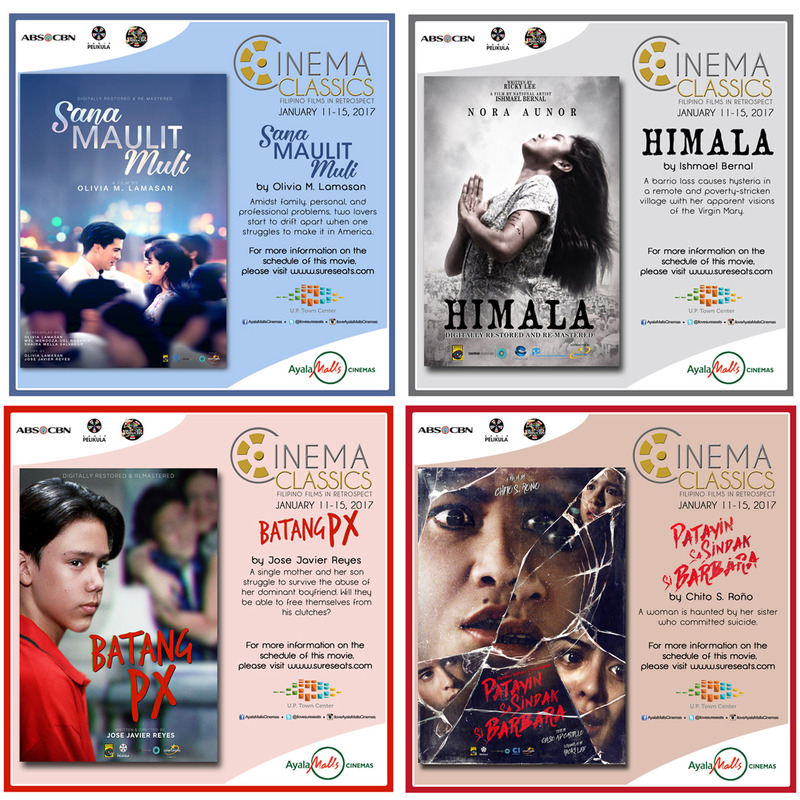 Check out Ayala Malls Cinemas’www.sureseats.com and social pages - Ayala Malls Cinemas (Facebook), @ilovesureseats (Twitter) and @iloveAyalaMallsCinemas (Instagram) for the latest updates and schedules of the classics.